In the film “Instant Family” Pete and Ellie (actors Mark Wahlberg and Rose Byrne) are an attractive, successful couple nearing middle age who become foster parents for three Latinx siblings. But don’t look for this dramedy to be the usual, formulaic film movie about white saviors who come in to rescue brown or black people in distress. “Instant Family,” shows the difficulties and rewards of becoming a foster or adoptive parent in a realistic, moving and inspiring way. The film covers all the stages foster parents go through. The honeymoon period when the children first come to a new home and revel in their new rooms and toys. The trauma and anger that can prompt children who are in foster care to act out and disrespect their foster parents. The issues that occur when parents foster and adopt children of different races or cultures. And the patience and love that is needed when new families are created through adoption. Director and writer Sean Anders, who has done raunchy comedies such as “Dumb and Dumber To” and “Hot Tub Time Machine,” based this family film on the experiences of himself and his wife Beth, who adopted three children. The Anders, who were at the screening Washington, D.C., hope the film will encourage other people to consider fostering and adopting. 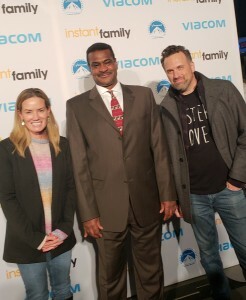 NASW CEO Angelo McClain with “Instant Family” Director and Writer Sean Anders (right) and his wife, Beth. Beth and Sean Anders credited social workers with being by their side throughout the adoption process, helping them overcome the emotional hurdles of the process. That is why Sean Anders has two strong social worker roles in the film. Octavia Spencer and Tig Notaro portray social workers Karen and Sharon, who run a support group for foster and adoptive parents. McClain hopes “Instant Family” will raise awareness about this issue. Social workers play a significant role in foster care and adoption, helping children find permanence. To learn more visit the National Association of Social Workers’ Help Starts Here Adoptions and Foster Care webpage.